Charles and Kate Dodge are on a mission – culinary and social – to make wines and liqueurs from locally sourced ingredients. Just as in France, where wineries are located to take advantage of the specific varieties of grapes grown locally, Putney Mountain Winery has worked with farmers to obtain the best possible fruit from New England. Then Charles crafts innovative recipes for their prize winning wines and liqueurs and bubbly juices. Apples, ginger, rhubarb, black currents to name just a few…the list goes on. And Putney Mountain Winery expands its mission by being a certified Vermont Green Business that is 100% solar-powered. 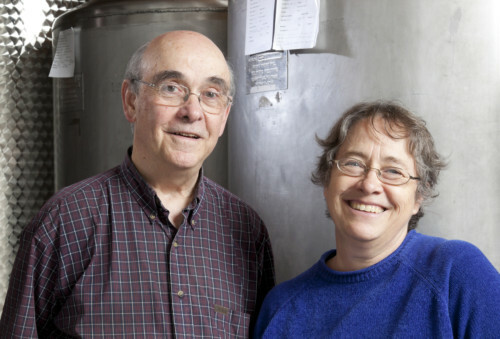 You can find Kate and Charles at their tasting rooms in Putney, Windsor and Quechee in addition to local Farmer’s Markets and festivals. You can find their products on store shelves and at your favorite restaurants. Happy customers trade their favorite new ways to use PMW’s offerings on social media. The Dodge’s say working with VtSBDC has allowed them to: 1. Change their focus to working more on the business and spending less time working in the business. 2. Learn to hire and retain the best employees. 3. Do a great deal more systematic planning on all aspects of the business. 4. Make budgeting more central to our operations. 5. Use the regular check-ins keep our attention on problems big and small.